When choosing to develop a new product or platform based on an embedded system, companies commit to spending time, money, and resources. There’s an enormous benefit to finishing this development as quickly as possible so that the product or platform can be released to the customers or users as quickly as possible. Fortunately, by using certain tools and methods, companies can in fact shorten the development cycle, and improve their time to market. I want to make a small distinction between a product and platform. The distinction surrounds the type of user. Embedded systems developed for external use by general customers are labeled as a product. When developed for internal use by specific end-users, it is labeled as a platform. Don’t minimize the prevalence of these internally-used platforms. I’m including controllers that are used inside a product sold to a customer (e.g., a controller that operates a forklift would qualify, or a condition monitoring device for a gas compressor would qualify). The key point to be made about these two classes of users is that both need tech support, repair services, upgrades, and so on. So, I’m going to refer to a platform as a product too. I want to describe each of these items a bit in this post and will do a few “deep dives” in future posts. As you might imagine, some of these groups associated with these steps are more amenable than others to doing things that improve time to market (TTM). I want to touch on these things quickly and leave some details to those future posts. The design activities are critical to choosing a platform that will achieve the requirements as quickly as is reasonable. The outcome of this group of steps has a big impact on the TTM. 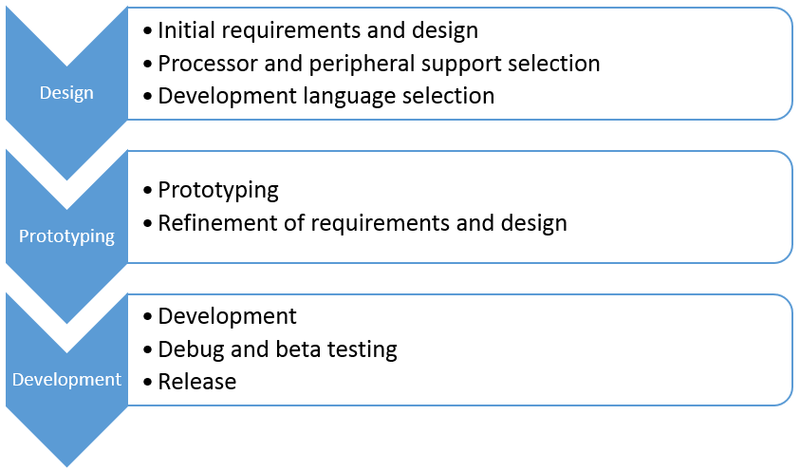 The prototype activities are also critical to achieving the requirements, but the way they impact the project is in identifying any changes to requirements and design based on the outcome of some initial proof-of-concept-level development and testing. This group is all about failing fast, quickly identifying weaknesses in the component and design choices. The last group of development activities is less critical to achieving the requirements, and is instead mainly focused on completing the development. There are some tools and techniques that can help speed TTM, but I think these tools have less effect (or maybe a better term is “smaller levers”) than the effect that the other groups have. So, with that setup, look forward to future posts on design, prototyping, and development when I give you some ideas to speed TTM for embedded systems.